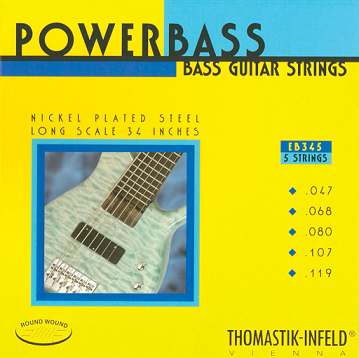 Power Bass Rock Series strings from Thomastik-Infeld have a very thin steel hex core. The new design is highly flexible, and the massive Magnecore winding achieves fascinating clarity and transparency of sound combined with maximum output. Handmade by expert craftsmen on microprocessor-controlled machines. Gauges: .047 - .068 - .080 - .107 - .119.